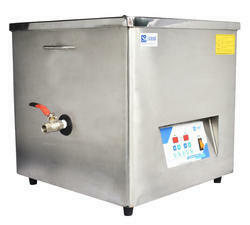 We offer wide range of Ultrasonic Cleaners In Hotel Industry. These ultrasonic cleaners are based on Ultrasonic processes which cleans faster in few minutes and exceeds in its efficiency, rather than all other conventional cleaning process. Ultrasonic Cleaners for Hotel Industry comes with water based cleaning media in standard as well as in customized configurations, in conformation to the customers’ specifications. This products from our side uses cavitation bubbles induced by high frequency pressure (sound) waves to agitate a liquid. The agitation produces high forces on contaminants adhering to substrates like metals, plastics, glass, rubber, and ceramics. Looking for Ultrasonic Cleaners For Hotel Industry ?